Chickpea Flour (24%), Rice, Potato Starch, Rapeseed Oil, Corn Flour, Chilli & Lemon Seasoning (7%) (Rice Flour, Salt, Spices (paprika, cayenne pepper, black pepper), Chilli Blend (chilli, cumin, salt, garlic, oregano), Garlic Powder, Onion Powder, Yeast Extract Powder, Citric Acid, Dried Yeast, Natural Flavouring, Lemon Juice Powder (Maltodextrin, Lemon Juice), Colour (Paprika Extract)), Salt. From humble chick pea to crunchy crispy chip, the wonderful flavour of the chick pea is infused with the touch of mild spiciness and zesty taste of lemon. 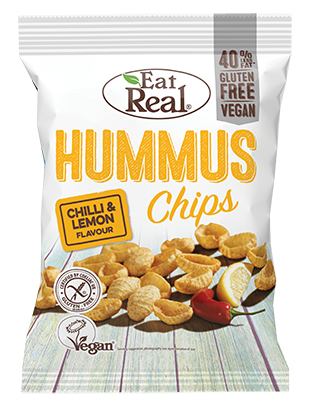 You'll really enjoy the chip as the flavours offer a perfect balance between the creamy taste of hummus and unique blend of spicy peppers and tangy lemon!